Laurent-Désiré Kabila, or Laurent Kabila, was born in 1939 and was murdered on January 16, 2001. Beginning in May 1997, he was the leader of a rebellion against the President of Zaire, Mobutu Sese Seko. Following this insurrection, he became President of Zaire and returned the country to its former name, The Democratic Republic of the Congo. Laurent-Désiré Kabila was born in Jadotville in the province of Katanga, a part of Belgian Congo in 1939. He came from the Luba tribe. He completed his studies in high school in Elisabethville and then studied political philosophy at a French university. He also attended the University of Dar es Salaam in Tanzania. In 1960 when he was twenty-one, Laurent-Désiré Kabila became a leader in political movements allied to the first prime minister of independent Congo, Patrice Lumumba. In 1961 General Mobutu Sese Seko deposed Lumumba, and the Congolese government had him assassinated on January 17, 1961. In response to this Coup d’Etat, Kabila and other Lumumba’s supporters started a guerilla war with the support of Che Guevara in 1964. The revolt was suppressed in 1965 by the Congolese Army with U.S. support. General Mobutu took control of the nation in 1965, established a dictatorship, and in 1971, renamed the nation Zaire. In 1967 Kabila founded the People’s Revolutionary Party, fighting to establish a self-sufficient (thanks to gold mining and ivory trading) Marxist territory in the eastern section of Zaire. In 1985 his guerilla movement collapsed, and he fled to Dar es Salaam where he began trading in gold. 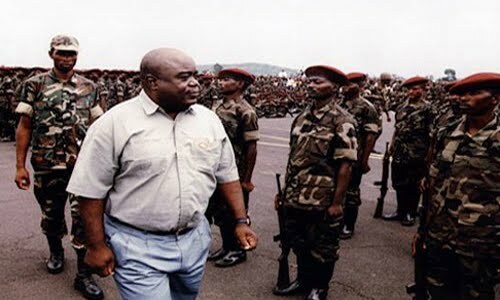 In September 1996, Kabila returned to Zaire and, with other dissidents against the Mobuto regime, founded the Alliance des Forces Démocratiques pour la Libération du Congo-Zaïre (AFDL – Alliance of Democratic Forces for the Liberation of Congo-Zaire). With the help of various tribal groups in eastern Zaire, he marched on Kinshasa, Zaire’s capital, with the intent of overthrowing Mobutu. When the president fled the capital, Kabila announced that on May 17, 1997, he was the new president of the country and promptly changed its name to the Democratic Republic of the Congo (DRC). Kabila quickly became a dictator, prohibiting political activities and governing by presidential decrees. He placed his leading opponent, Etienne Tshisekedi, under house arrest. However, in May 1998, Kabila authorized a legislative assembly. During this supposed period of political liberalization, opponents continued to be arrested. In August 1998, some of the Eastern Zaire groups that helped place Kabila in power now opposed him and began a rebellion against his government, accusing it of numerous human-rights abuses, including large-scale massacres of civilians, and the president’s apparent favoritism toward his own ethnic group for political posts. Furthermore, his former national allies, Uganda and Rwanda, began supporting the rebels after his forces invaded both of them in pursuit of guerilla fighters. Kabila, however, found new allies, Angola, Zimbabwe, and Namibia, all of whom sent troops into the Congo in order to support Kabila repression. On the January 16, 2001, a bodyguard shot President Laurent-Désiré Kabila in the presidential palace of Kinshasa. Two days later Congolese officials announced his death. His son, Joseph Kabila, became the next Congo president.